Celebrity Cosmetic Surgery: Do People Really Want Long Eyelashes That Badly? I have long eyelashes but they're not thick so I have quite a morning ritual with eyelash curler and two different mascaras, one for blackness and one for volume. 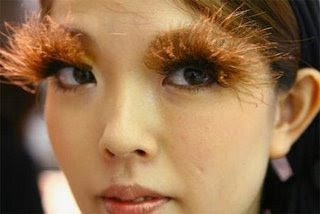 So, yes, I believe women really care about their eyelashes. It's such an important part of looking glamorous (if that is the goal and it is for me). However, I do draw the line at this product. I'd be terrified that it might have an effect on my vision and vanity bites the dust in favor of health. Oh God yes, I'd buy this the moment it's available here! Any info on whether it's safe to use for a contact lens wearer? Either way, I've done my own eyelash extensions, and when I don't have my extensions it's tons and tons of mascara. For a festive look I always add false lashes to the mix. I would love it if I didn't have to constantly glue stuff either to my lashes (extensions) or the skin (false lashes)! If it's safe, I'd definitely consider that! My lashes are a nightmare, they're short, blonde at the tips and won't curl.. Still would have to think twice though, because the straightness (they even hang on bad days!) could be caused by heavyness.